When we found out we were pregnant a few years ago, I immediately started thinking of the nursey. I knew I didn’t want anything with the typical pinks or blue; and then when we found out it was a girl I knew exactly the direction I wanted to take the room in. 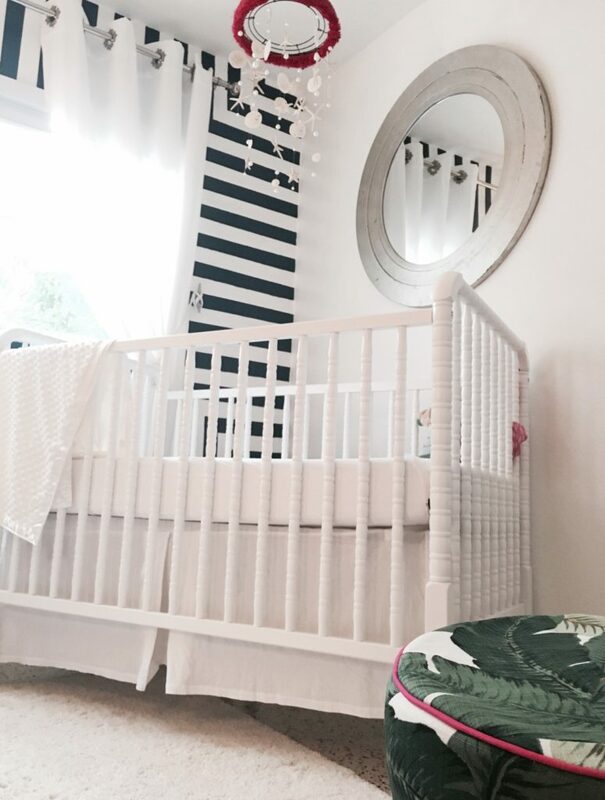 I can’t beleive I’m finally posting her nursey now; because soon we’ll be doing another one room challenge where I’ll be showing you her little girl room transformation; but what can I say, better now than never! 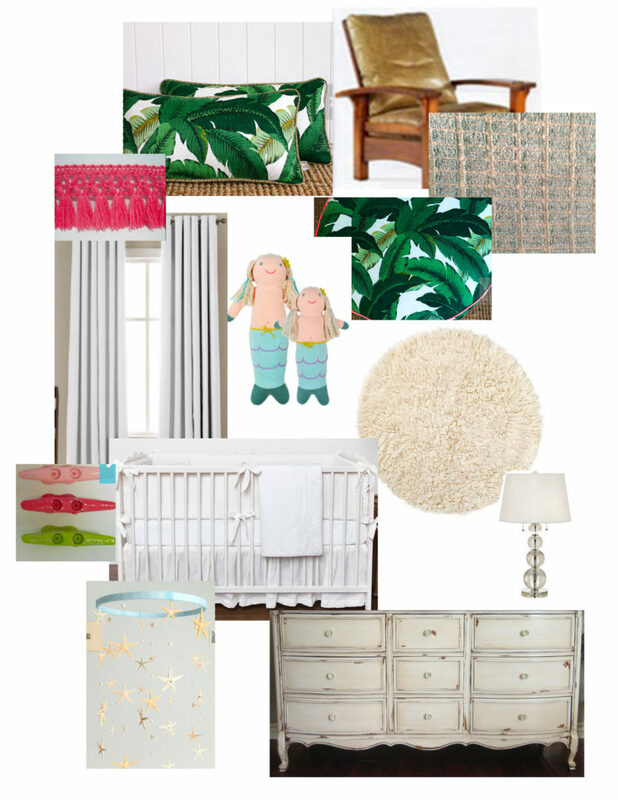 Like every room design, I start with my color pallet, pull in my fabrics and then finishing touches. I add everything to a design board and go from there! I knew I wanted to keep most of the walls a nice bright gloss white (easier to clean). 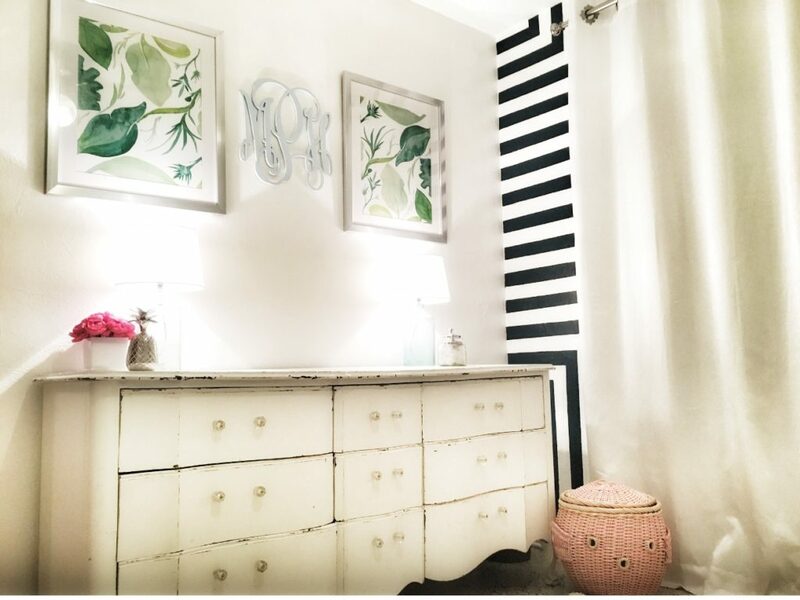 I used the wall with the large window as an accent wall and had already painted stripes which you can view on the post here. I also knew I wanted the larger pieces of furniture to be white as well; that way it made the space seem larger. I have an antique rocking chair that belonged to my great grandmother that we had reupholstered in a light blue check fabric. The shape of the chair is similar to the one in the design board. 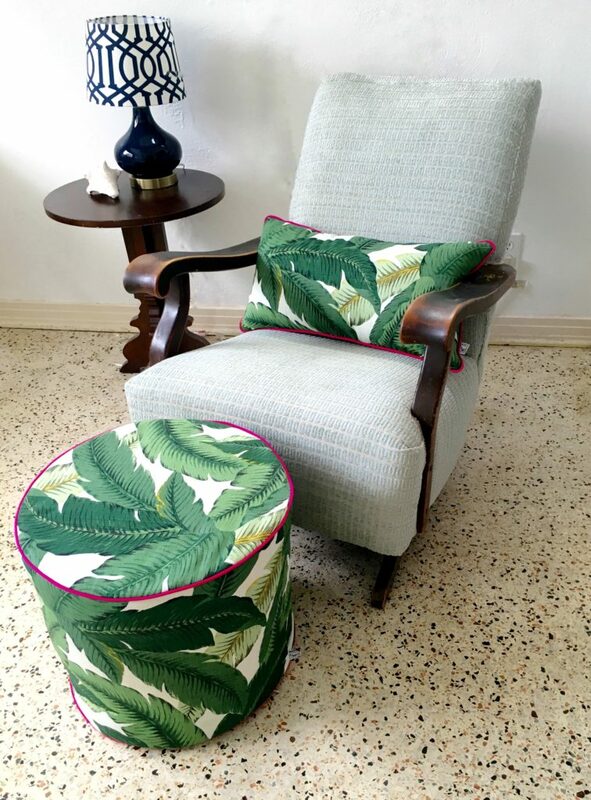 I found some really great Tommy Bahama banana leaf fabric pillows and footrest on Etsy trimmed in a hot pink. 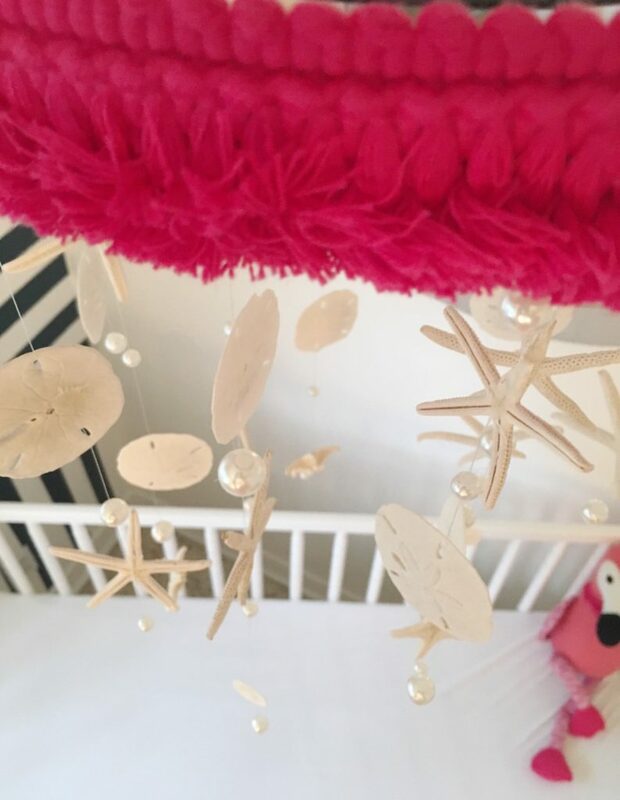 I also hand crafted a mobile, using the same shade of pink from the pillows; I’ll make a blog post soon about how I created it! The crib was angled in the corner of the room, on the same side of the room as the chair. It really helped to anchor the space . I added a super fuzzy white rug, some lined white blackout curtains and greenery. I read that having a real non-toxic plant in a child’s room helps filter the air and may even prevent things like asthma! On the opposing side of the room, I placed the larger dresser. And also used it as her changing table (we made sure to secure it as per the directions) which isn’t pictured here. I purchased her monogram from an Etsy shop and the cute fish hamper was purchased from pottery barn kids. I’m anxious to see how it’s going to look once I change up the space a bit! Tell me, how did you decorate your nursey?? What it something that came together at the last minute or did you really think about every element? In the meantime follow me on Instagram ! Until next time; Happy Creating!! « Tropical 1st Birthday Accessories!